Two years ago this month, Vertical World and the climbing community lost one of their own: Ross Halverson. Getting him down from midway up Mt. 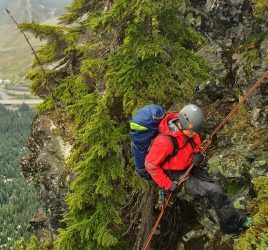 Garfield was one of the most technically challenging rescues we have done; given the recent rock fall that destroyed some of the climbing anchors, rain, and uncertainty of his exact location on the climb. There isn’t a September that goes by or time we climb at Vertical World we don’t think about those few days. The mission report from the rescue is included below. It reminds me both how proud I am to be a part of this determined group of rescuers, and how mistakes can happen to even the most proficient climbers among us. On Monday September 8th 2014, at 1137, SMR was paged to assist with recovery of a climber that suffered a fatal fall on Infinite Bliss, a 23 pitch rock climb in North Bend. The accident happened sometime Sunday, but the climber’s partner, who was the reporting party, was unable to reach 911 until Monday morning. Larry, Heather, Jason, Garth, Bree, Greg, Wes, Bob, and Taylor responded to Valley Camp around 1230, which served as our base for the operation. Garth initially spoke with the reporting party, who thought that the fallen climber was on a ledge somewhere between pitches 10 and 15. Given the time of the day, construction on the road that limited travel, and rain forecast for the night, it was too late to start climbing the route. So, they decided to see if they could get a visual on the fallen climber from the base of the route, the climber’s path along the first few pitches, or from the other side of the river to help with planning the recovery. Team 1 (Wes and Heather) and Team 2 (Taylor, Bree, and Jason) explored the base of the route, while Team 3 (Greg and Garth) explored the route with binoculars from the other side of the river. Larry remained in base as the Operations Leader. Snohomish’s Helicopter Rescue Team (Snohawk) was also called out to see if they could help locate the fallen climber from above. After landing at Valley Camp to get briefed around 1445, they flew above the climb to see if they could locate the subject, with Bob joining them. None of the teams were able to locate the subject, with Snohawk returning back to base around 1630 and teams returning around 1830. Given the weather called for rain on Tuesday, the teams decided to resume searching Wednesday. Tuesday morning, the deputy contacted Larry to meet with the reporting party to see if he could get more detailed information about the incident and where the subject might be on the route. After looking at the pictures of the climb, the reporting party estimated that the subject was located around pitch 13, based on what she could see in the pictures of the route and where she had spent Sunday night. Later Tuesday afternoon, Larry and Bree discussed the options for the following day. They decided it would be best to tackle the rescue in two waves. First, a small group would start the climb early in the morning to locate the fallen climber and lower him down the climb. Second, a larger group would deploy around 1430 in the afternoon to help with the steep angle evacuation down the climber’s trail. Later Tuesday evening, Bree, Garth, and Taylor met to work through the specific details of the climb/lowering system they would use as well as what gear would be needed. Larry worked with Wes, who would be the rescue leader on the ground, as well as Mark, ESAR’s operations leader, to align the plan for the ground evacuation as well as resources for the day. Wednesday morning at 0615, Bree, Darby, Taylor, Larry, Bob, Bill, Art, and Garth reported to base. The members held an initial brief outlining the plan for the day. Team 1 (Bree, Darby, and Taylor) would climb the route. Team 2 (Bill and a deputy) would try to get and maintain eyes on Team 1 from down below. Larry (Operations Leader), Bob, and Art would remain in base. Teams 1 and 2 headed into the field at 0700. Team 1 reached the base of the climb at 0830 and headed up. They soon found themselves in the clouds, so Team 2 was unable to get eyes on. Team 1 located at the subject at 1120 near pitch 10, 3 pitches below where they expected to find the subject. They packaged the fallen climber and started lowering the subject at 1215. Given how quickly the team climbed and located the subject, Larry decided to accelerate bringing in additional resources and asked additional teams to start arriving in base as quickly as possible. Wes and Karl first arrived at base and reviewed the plan/resource plan for the afternoon. Garth, Brian, Gordy, Rich, Yogesh, and Drew later arrived at base around 1300. They divided into three teams; bringing in additional climbing gear, the litter, 2 rigging kits, and 2 300 foot ropes. They left base at 1330 and headed up the trail at 1430. Three teams of ESAR members as well as Nick from SMR later arrived at base. They also divided into three teams, with two teams (Teams 6 and 7) heading into the field at 1515 and the other (Team 8) heading into the field at 1615. Teams 5 and 6 brought in the litter wheel and 2 additional 300 foot ropes. Teams 3, 4, and 5 arrived at the base of the climb at 1520. Team 1 arrived at the top of pitch 1 around 1600, and the teams worked together to get the subject down from there, which was one of the more challenging pitches: there was a long, angling traverse to get the subject back to the climber’s trail. 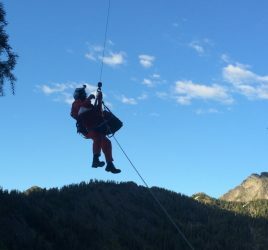 A member of team 4 walked a rope from the start of the route up and over to the rescuers, and that line was used to pull the patient package across to the climber’s access trail. Everyone was back at the base of the climb at 1700. All teams then worked to transition the subject to the litter and begin lowering the litter down the trail. Eventually, when the slope angle decreased, they were able to put the wheel on the litter and arrived back at the trailhead at 1905.